The government has denied reports of a rift with its intelligence chief over Iraq. As Tony Blair's government continues to deal with the fallout from its use of intelligence in the lead up to war, it has been suggested that the head of MI6 could be retiring due to tension with Downing Street. Sir Richard Dearlove, 58, will stand down in August 2004, having completed five years in the post known as 'C'. The Foreign Office confirmed the departure, but said it was normal practice for MI6 chiefs to spend about five years in the position. "This is in no way connected to events relating to Iraq," a spokesman said. However, the Observer newspaper said his retirement was motivated by differences with ministers over Iraq. Liberal Democrat foreign affairs spokesman Menzies Campbell said there was "considerable tension" between Downing Street and the intelligence agencies. But added that it "dates back long before the present controversy" over Iraq. 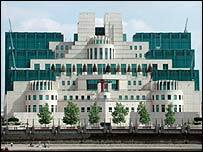 It is government policy not to discuss MI6 internal operations, and a successor for Sir Dearlove has yet to be announced. The Foreign Office spokesman said: "Sir Richard Dearlove continues to enjoy the fullest possible confidence of the prime minister, the foreign secretary and the rest of the government on Iraq and all other intelligence issues. "He intends to leave his post as planned in August 2004 on completion of his normal tour of office. " Former defence secretary Tom King said it was a "very tough" job which it would be normal to want to leave after five years. "It's been made in recent times even tougher so it would have been 24 hours, seven days a week, with calls, pressures and challenges of one sort or another," Lord King told BBC Radio 4's Today programme. Conservative spokesman Patrick Mercer said it was essential that Sir Richard's successor was a fully independent figure. "Sir Richard Dearlove has been a highly competent and principled MI6 Chief," he said. "He will be missed as the war on terrorism proceeds and I trust his successor will follow as independent and analytical line as he has. "I very much hope that the new head of MI6 hasn't shared a flat or played in the same band as Tony Blair," he added. The Foreign Office spokesman said Sir Richard Dearlove was appointed in August 1999 for a term of five years. It was recently reported that Sir Richard took the unusual step of appointing a deputy. The Observer suggested Downing Street would prefer the chairman of the Joint Intelligence Committee, John Scarlett, to take over from him. "The Foreign Office denies Sir Richard is leaving prematurely"